As I was conducting my monthly review of home sales in NE Tallahassee, I stumbled across a certain type of Summerbrooke house that is defying the market. That's right, as everybody else in the Tallahassee real estate market is still dealing with falling values, I have found a type of Summerbrooke house that has been rising in value in 2012. So if you are interested in buying a home in Summerbrooke or selling a home in Northeast Tallahassee, you probably want to know more about this specific type of Summerbrooke house. As you can see from the real estate graph above, Summerbrooke house prices are on a steady decline. The average price of all Summerbrooke house sales this year through October has been $325K. 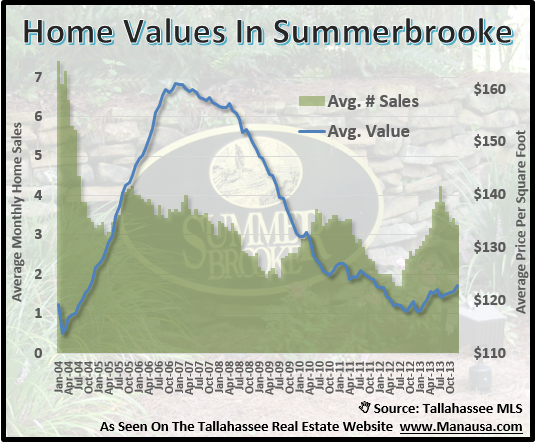 Like all other neighborhoods in Tallahassee, Summerbrooke still has more sellers (24 homes for sale in Summerbrooke as of this writing) than buyers and thus is fighting real estate depreciation. The average value of a Summerbrooke house has fallen 4% in 2012, as can be seen in the graph below. So what type of Summerbrooke house is defying the market? Houses with swimming pools! In the graph below, we see that homes with pools in Summerbrooke have appreciated slightly this year, while those without pools continue the depreciation trend that began in 2006. I suspect this trend will be short lived, but people who own a Summerbrooke house with a pool should enjoy it nevertheless. 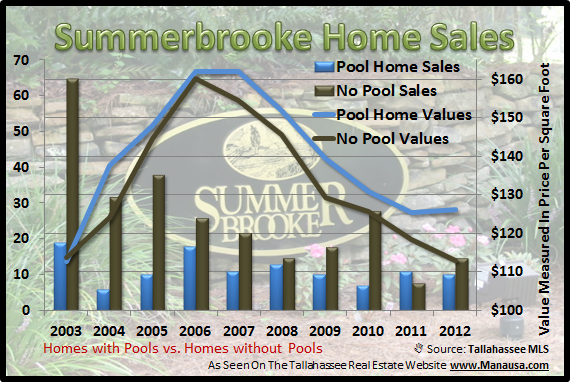 The following is a list of Summerbrooke house sales in the Tallahassee MLS from the beginning of 2009 to present. I hope this report on Summerbrooke house sales gives you a better understanding of homes in Tallahassee, please check back from time to time for more Tallahassee neighborhood reports.